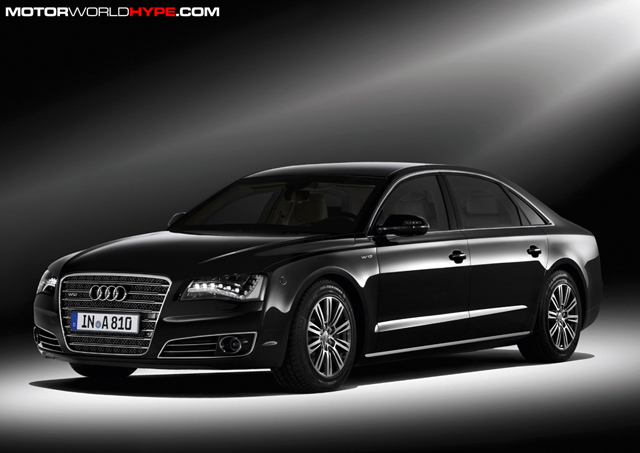 Why did I refer to the new Audi A8 L Security as “Tony Stark Hype”? Because this is so what he would be driven around in! The Audi A8 L Security starts off as a “regular” Audi A8 L but then it gets sent up to a special top secret, guarded, cell phone free work shop with security doors. Only a few people have clearance to this work shop and those people are highly trained engineers and builders who specialize in security vehicle design. Once they get the A8 L in their shop they shoe horn in a 500HP W12 engine. Then, they work in class VR7 ballistic protection. That means the sheet metal will protect the occupants from high-powered ammunition and explosions! Worried about a tear-gas attack? No problem! The A8 L Security has a special system that pressurizes the air inside the cabin to keep anything outside from seeping in and there are oxygen tanks that give you fresh breathing air for enough time to drive out of the danger zone. What about getting trapped? Well, there is a full communication system in the car so that you are still in touch with the outside world. Part of the system includes microphones and a loud speaker mounted in the front grill. If you get stuck in the car and have trouble getting out the doors are attached with special explosive screws that will separate the door from its hinges so you can make your exit. And if you get your tires shot out in the midst of an escape each tire has a ring of synthetic material inside them which will allow you to still drive on blown tires at speeds up to 50mph! All of that stuff is cool but I think the best part about the A8 L Security is the fact that despite all of its safety enhancements the interior is still just as cushy and luxurious as a regular A8 L. It still has the leather, premium sound system, entertainment system with TV tuner and two screens, and even a reclinable rear char with seat heaters and massage. So it is clear to see now that when Tony Stark isn’t flying around saving the world in his “high-tech prosthesis” he is being driven around in one of these bad boys… There are a few more pics below as well as the press release that has all the extra details that I didn’t get to. At 5.27 meters (17.29 ft) in length, the Audi A8 L Security is a large, representative luxury sedan, hardly distinguishable to the eye from the production version. The LED headlights, which use light-emitting diodes for all functions, lend a striking expression to its front. They are part of the standard package in the A8 L Security W12. When developing the basic design for the A8 model line, Audi engineers already had the high-security version in mind from the very outset. The result is a totally integrated concept far superior to any retrofit solution currently available on the market. All of the major components were analyzed with regard to their deformation properties, giving the A8 L Security an excellent crash performance that is also mindful of the other party involved. The armored sedan’s custom security modifications are performed by hand in a small, well-guarded workshop – on a production floor with specially secured doors, where the use of cellular phones is strictly prohibited. The basis for the high-security car is a previously modified aluminum production body constructed at the Neckarsulm plant as per the Audi Space Frame (ASF) principle. Specially trained technicians put in roughly 450 hours of work to incorporate the security features – in the uncompromisingly high quality Audi is known for. When this stage of the process is complete, the car returns to the factory for final assembly. The A8 L Security has been officially certified by a German-government ballistics testing facility in Munich for compliance with the class VR 7 ballistic protection standard (tested as per BRV 2009 guidelines). The abbreviation BRV stands for Bullet Resistant Vehicles. The car’s resistance to explosions was tested as per ERV 2010 guidelines (ERV = Explosion Resistant Vehicles). Class VR 7 ballistic protection imposes the strictest standards on civilian high-security sedans. The sheet metal and glazing in the passenger cell must withstand firing with NATO hard-core ammunition. 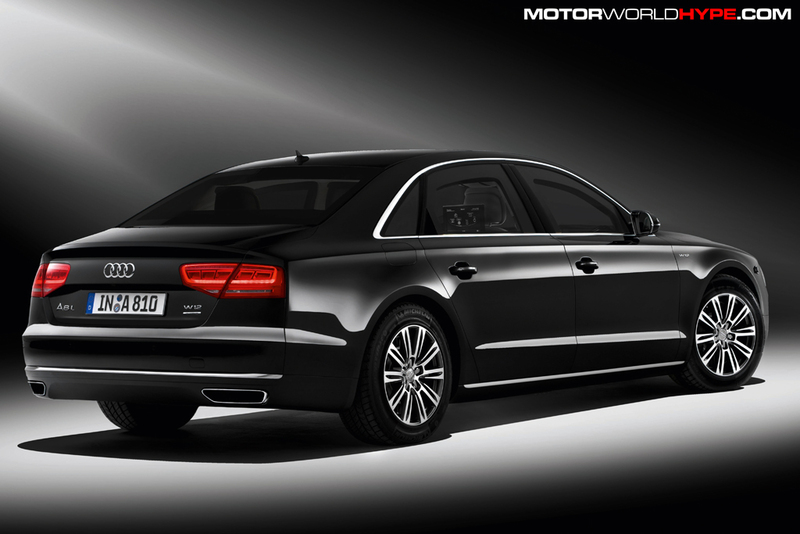 In certain areas, the armoring on the Audi A8 L Security even complies with the criteria for class VR 9 and VR 10. The aluminum side sills have solid steel sections built in. These provide increased protection against explosive weapons – an area that has seen a marked stiffening of requirements in recent years. Made of an innovative aluminum alloy, the car’s armored floor serves the same purpose. 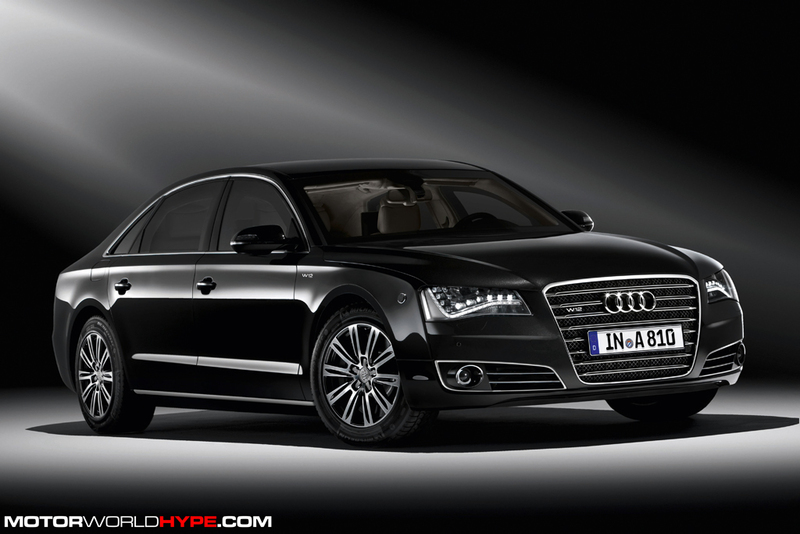 The Audi A8 L Security is capable of withstanding an attack with a military hand grenade. Even an explosive charge defined from the test program does not pose a lethal threat to passengers, as demonstrated by measurements taken during testing on dummies. A key area in the A8 L Security is the “communication box” in the luggage compartment. In addition to the control units for the vehicle and communications electronics, it holds the optional components that further enhance the passengers’ safety, along with the additional battery. The heavily armored communication box is novel in another way: It has comparatively light ceramic doors, and its frames are made of aluminum. Customers can also request special protection for the battery and the fuel tank. A standard two-way communication system allows passengers in the A8 L Security to communicate with the outside world when the windows are closed. The system makes use of a speaker in the single-frame grille as well as microphones for the cabin and exterior. 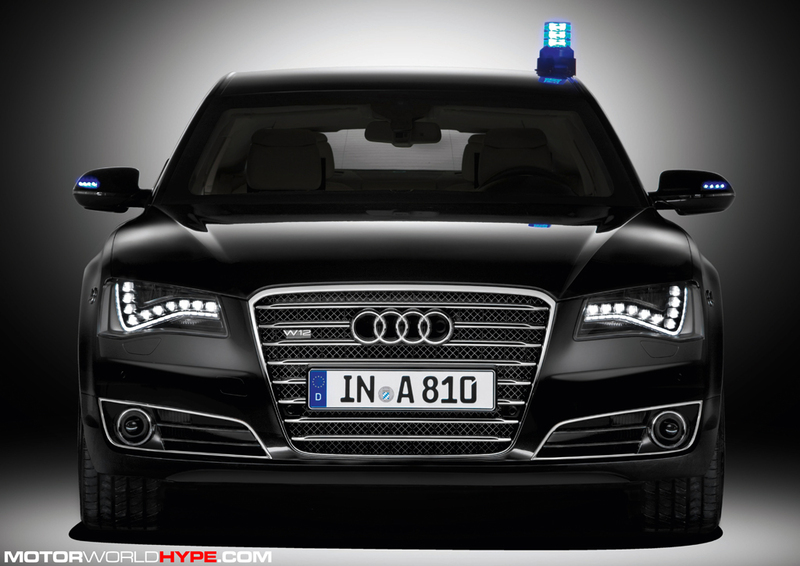 Despite the high level of security it offers, the A8 L Security is a relatively light armored car. As is always the case in an Audi, the lightweight design plays a central role here. Outfitted with the W12 engine, the A8 L Security is the lightest vehicle among its peers. For A8 L Security customers, a multitude of special options are available for enhanced security. Among these is the emergency exit system, a technology patented by Audi. When the driver or rear passenger presses a tamperproof switch and pulls one of the inside door handles, pyrotechnical separating screws in the hinges detach the door from the body. The door can then be knocked out with a slight push. Another security feature is the fire extinguisher system, which is activated via heat sensors or by pushing a button. The extinguishing agent flows from two canisters installed in the luggage compartment through two tubes running along the underfloor. Nozzles spray the agent into the wheel arches, onto the underfloor, onto the tank, and into the engine compartment. The emergency fresh-air system operates with two oxygen cartridges housed in the protected area. At the push of a button, the system supplies fresh breathing air to the interior via vents in the roof lining. The supply lasts long enough for the car to pass through a danger zone or get out of a danger zone it is currently in. The system works by generating positive pressure in the vehicle interior to prevent toxic gases from penetrating the cabin. Yet another option is what Audi calls security start – a feature that allows the driver to start the engine remotely via a radio signal. Numerous additional solutions round out the offering: a smoke extractor for the passenger compartment, an LED signaling system for convoy travel, flashing lights, a siren, a preparation for professional mobile radio systems, a flag holder, a permanently installed telephone, an accident data recorder, an additional rearview camera and a heated windshield plus partially heated side windows. Going beyond all of this, Audi will also ensure customers’ special requests are taken care of an individual basis. The interior of the A8 L Security is captivating, with its spacious design and workmanship on a craftsman’s level. The comfort on board is first class – the standard package includes a four-zone climate control system with an ionizer to freshen the air, electric rear blinds, the sonorous Bose surround sound system and a TV tuner. In the rear are two individual, seats with power adjustment. Also featuring a versatile adjustment range, the front comfort seats offer heating as well as optional massage and ventilation functions. In addition, the A8 L W12 Security comes with a standard full-leather package. On request Audi will install the “relaxation seat” – a widely adjustable right-hand rear seat with a power-adjustable footrest, heating and massage. Also available is a full-length center console with large storage compartments, complemented by the rear seat entertainment system with two 10.2-inch displays. Optional features such as a folding table, a refrigerator and a parking heater make the time spent in the car even more pleasant. For the high-security version of the A8 L, Audi offers virtually the entire gamut of advanced technologies available for the production version. The standard MMI Navigation plus system works with a large hard disk, a high-resolution eight-inch monitor and a fast 3D graphics processor. Its groundbreaking feature, however, is the touchpad – the MMI touch. It gives the driver intuitive control of many functions. The navigation destination, for example, can be entered by tracing the letters on the pad with a finger. MMI navigation plus is tightly integrated with the assistance and safety systems in the Audi A8 L Security. It reads the road ahead and provides the data to the control units for the automatic transmission, the headlights and the optional adaptive cruise control with stop & go function. With their increased intelligence, these systems can recognize complex scenarios and predictively support the driver. The Audi pre sense safety system can reduce the severity of accidents and their consequences in many cases. The A8 L Security comes equipped with the pre sense basic version of the system, combined with the pre sense rear feature, which is coupled with the Audi side assist lane-changing system. Other optional systems enhance safety and comfort even further. These include Audi pre sense front as a component of ACC stop & go, night vision assistant with highlighting of detected pedestrians and Audi lane assist, which detects boundary lines on the roadway. A standard high-end feature is park assistance plus with Audi Top View – a system consisting of four cameras mounted on the car to monitor its surroundings. A computer compiles images from the cameras and presents them in various views on the onboard monitor. The Cornerview function gives the driver a glimpse of traffic crossing in front of the sedan – a practical aid when maneuvering through narrow exits, for example. Audi also offers many attractive multimedia modules. The Audi A8 L Security is outfitted with the Bluetooth car phone online as standard. A complete, fast connection to the Internet is established via an integrated UMTS module, and a partnership with Google endows the car with innovative, intelligent functions. Passengers can connect their mobile terminal devices to a WLAN hotspot. For discreet telephoning, separate telephone handsets are available as an option. Audi is launching the new A8 L Security with a superb engine – the W12. The direct-injected gasoline engine owes its name to the W-shaped layout of its cylinders – four rows of three cylinders each, merged into two banks. From a displacement of 6.3 liters, the compact, lightweight W12 pumps out 368 kW (500 hp) of power and 625 Nm (460.98 lb-ft) of torque, with the latter readily available at 4,750 rpm. The W12 is captivating, with its smooth running performance, its subtle, musical sound and its power. It accelerates the A8 L Security from 0 to 100 km/h (62.14 mph) in 7.3 seconds. In consideration of the tires, top speed is limited to 210 km/h (130.49 mph). The high-security sedan consumes just 13.5 liters of fuel on average per 100 km (17.42 US mpg) – by far the lowest figure among its direct competitors (performance and consumption figures are preliminary). Compared with the predecessor model generating 331 kW (450 hp), fuel consumption has dropped by 3.0 liters per 100 kilometers – that’s an improvement of 18 percent. In the coming year, Audi will offer a second engine version, which will combine outstanding pulling power with surprising efficiency. Its average consumption of 10 to 11 liters per 100 km (23.52 to 21.38 US mpg) will earn it a best-in-class ranking in terms of fuel efficiency. In both engine variants, power is transmitted via an eight-speed tiptronic featuring a large overall gear spread. Its control system is electronic, operated with an elegant selector lever or rocker switches at the steering wheel. The quattro permanent all-wheel drive system conducts the power from the engine to all four wheels. In the standard configuration, the sporty drive is emphasized at the rear; if the situation calls for it, the drive system redirects a majority of the torque input to the axle with the better traction. The A8 L Security provides luxurious ride comfort. Audi developed its chassis, brake system and electronic control systems specifically for the increased weight; in the wheel control arms, for example, the tensile strengths, materials and wall thickness have all been recalibrated. The adaptive air suspension with controlled damping is integrated in the Audi drive select system, which enables fine-tuning of a number of parameters. The optional dynamic steering rounds out the range on offer. The high-security sedan is fitted with standard 19-inch forged wheels featuring a semipolished, two-tone finish. The specially sized 255/720 tires have a high load index of 117. Synthetic rings on the rims allow the vehicle to continue traveling at speeds up to 80 km/h (49.71 mph) even after a malfunction has occurred. A tire pressure monitoring system that continuously checks the settings is also part of the standard equipment. Audi offers a full-size spare tire as an option. The Audi A8 L Security W12 will be ready for delivery in late summer. An additional engine will follow in 2012. Audi supports its customers with an extensive range of services and a special training course for drivers and owners.